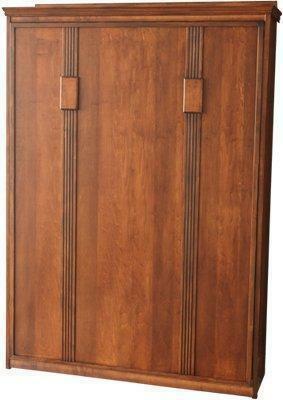 This Lincoln Vertical Murphy Bed is proudly made in the USA by an Old Order Amish Man! A state of the art piston lift mechanism that uses only a few moving parts. The wall bed lift system is counter balanced and designed for daily use. Standard with a locking mechanism that prevents the bed from being lowered incorrectly and locks the bed inside of the wood frame when it is not being used. Any standard innerspring mattress can be used with this wall bed. The bed mechanisms are completely contained within the cabinet and require no adjustments. This Amish bed ships unassembled, however, assembly instructions will be included. Please note that a mattress is not included with your purchase of this murphy wall bed. This bed comes with veneer sides to avoid splitting, warping and related concerns that similar hardwood sides are prone to encounter. CAUTION: This murphy bed contains stored mechanical energy. The anchor hardware must be securely fastened to the wall. Failure to do so may result in severe injury or death. Give one of our Amish Furniture Specialists a call today at our toll free number - 866-272-6773 if you have any questions or concerns. Our team of experienced professionals will be happy to assist you with any questions that you may have about our furniture or process. Max Mattress Depth of 10"
Unit ships in four pieces and can be broken down further to fit through doorways and openings.